If you’ve only been to the Greek islands, you’ve been missing out on another side of the country. The mainland, with its countless small towns, vibrant farms, and picturesque landscapes, is a curious (and hungry) traveler’s dream trip. Fathom editor Daniel Schwartz takes us on a spin through the heartland. 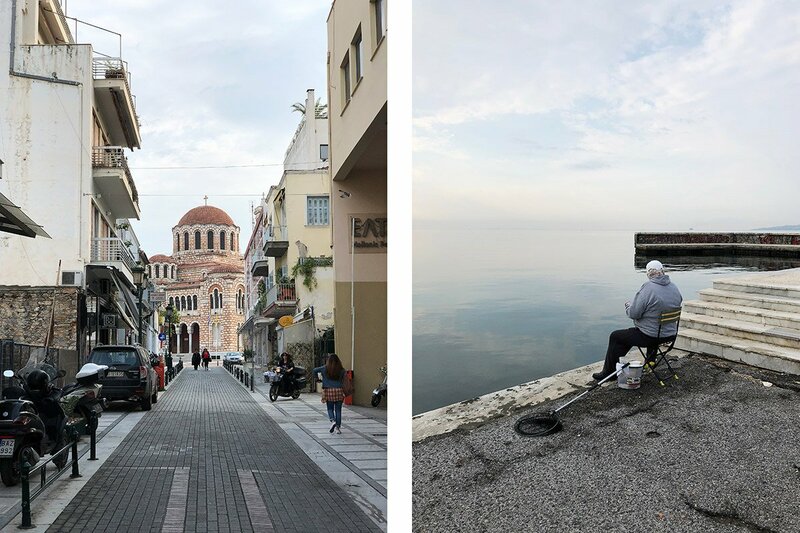 THESSALY, Greece — Few tourists make it out of Athens unless they’re on a ferry to one of the country’s roughly 200 inhabited islands. 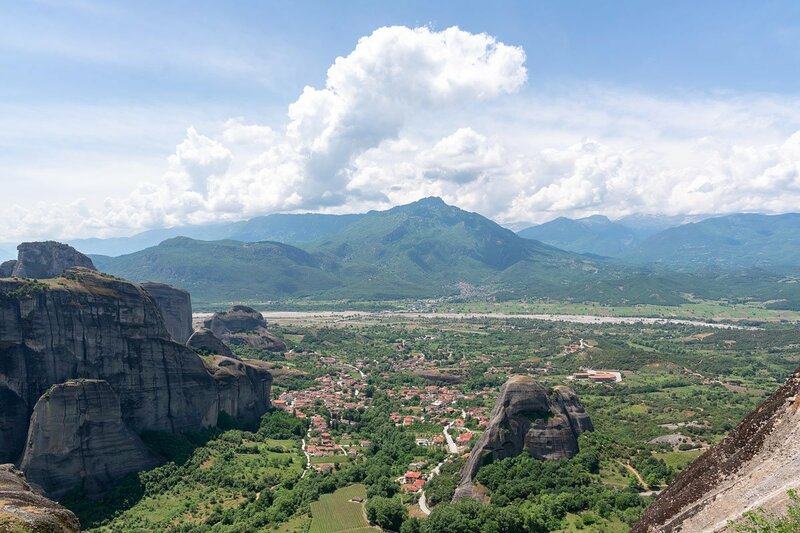 Fewer still take the four-hour drive north into Thessaly, the breadbasket of Greece, a verdant landscape blanketed by forests, farms, rivers, mountains, and small towns that feel stuck in time. For those only familiar with island beaches, the mainland is another side of Greece entirely, and one that’s worth a visit. 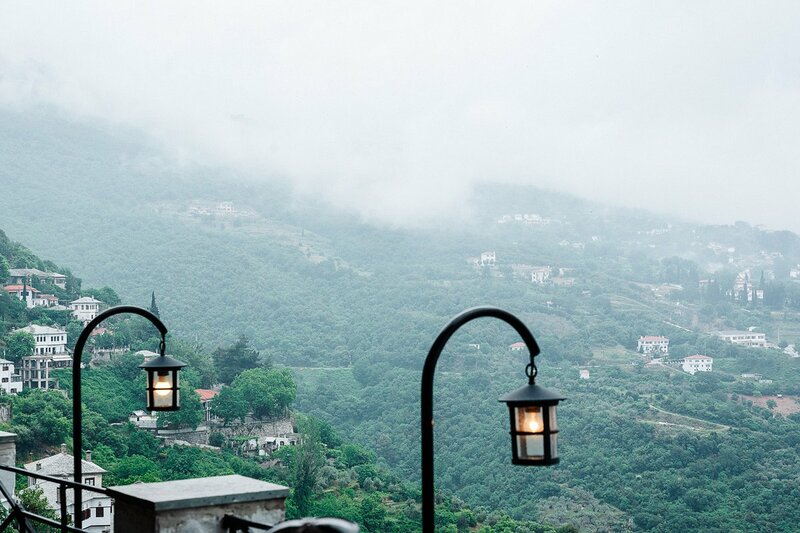 I spent a week exploring Mount Pelion, an area overlooking the Pagasetic Gulf known for its splendid natural beauty and many culinary delights, as well as Meteora, an otherworldly rock formation in the heart of the country that looks like it was dropped from the heavens. I visited a total of zero islands during my stay, and, flying under the tourist radar through small towns and local tavernas, didn’t feel like I missed out at all. Here are three mainland spots worth plotting on your map. At the base of Mount Pelion sits Volos, a modern city notable for being the ancient port of departure for Jason and the Argonauts that’s known today for being a major jumping-off point to the mountainside and nearby Sporades islands as well as a fantastic place to eat and drink. Not many international tourists know this, as Volos is mainly a place nationals come for holiday, but the city is home to a particular style of meze, or small plates, that traces its roots to Greeks who settled in the area after being expelled from Turkey following the Turkish War of Independence in the early 1920s. 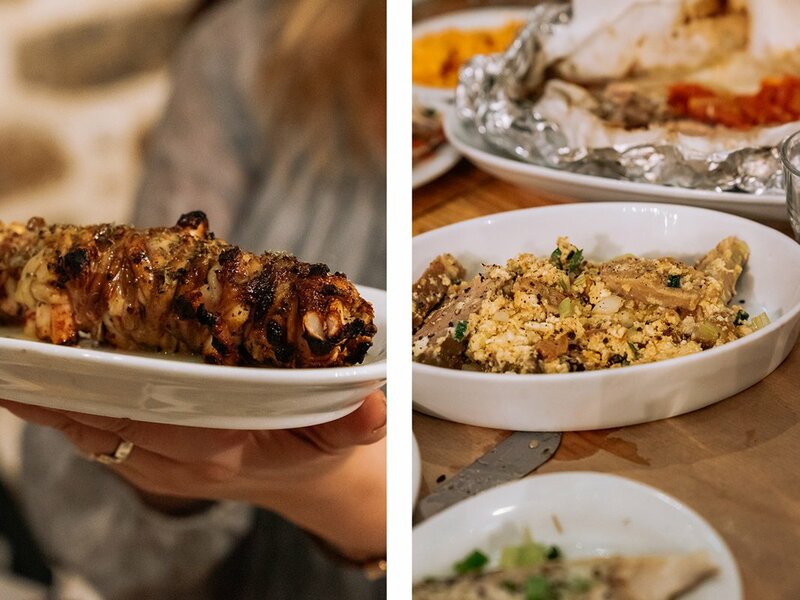 The best place to get a taste of the Turkish-tinged cuisine these refugees brought with them is at one of the city’s many tsipourádika, or taverns where tsipouro, a grappa-like spirit distilled from grape pomace, is consumed in ritual-like fashion alongside a series of small plates. 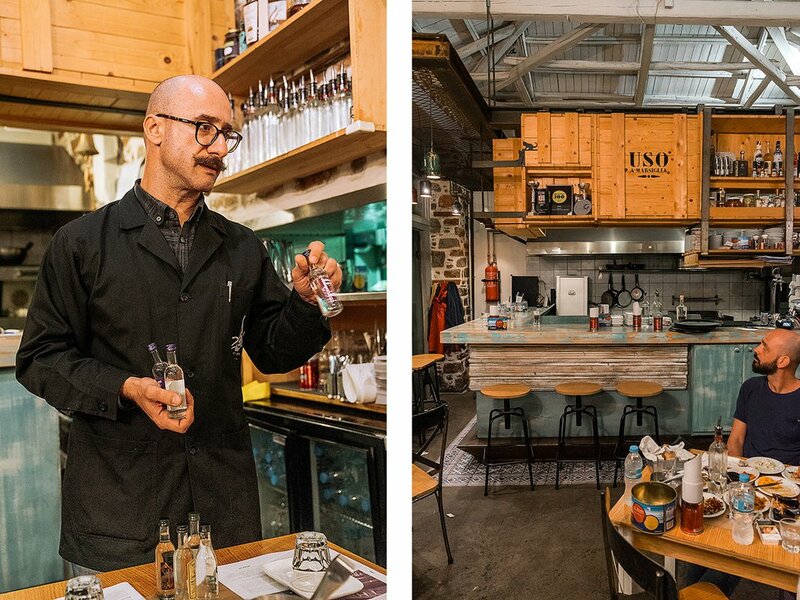 Order a few rounds of the spirit, which usually arrives in adorably tiny bottles, along with savory snacks. 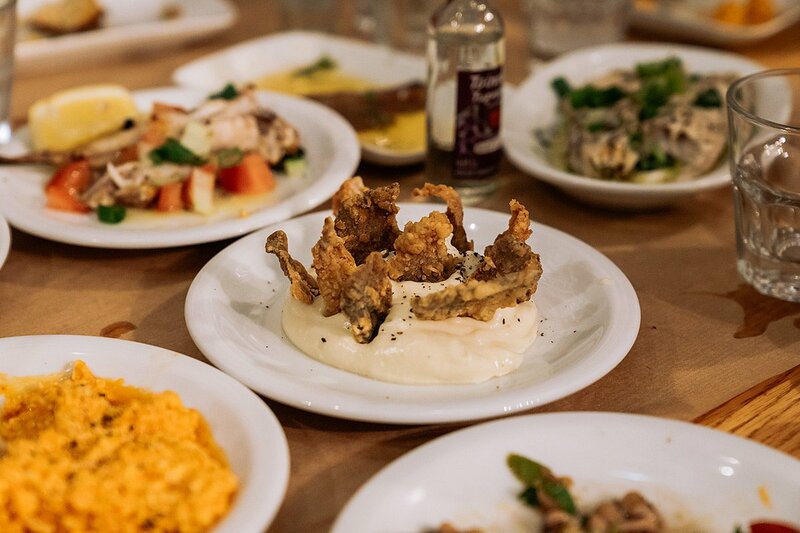 At first, meze are salty and spicy, their flavors intentionally strong to stand out after the first round of tsipouro singes the tastebuds. As the drinking continues, the flavors become more subtle and complex, all the better to pick apart when tipsy. At the end, heavy proteins are served to help soak up the alcohol and prevent hangovers. Andreas Diakodimitris in his restaurant, Me Zen. Kokoretzi (left) and scrambled eggs with meat (right). Taramasalata with crispy cod skin on top. 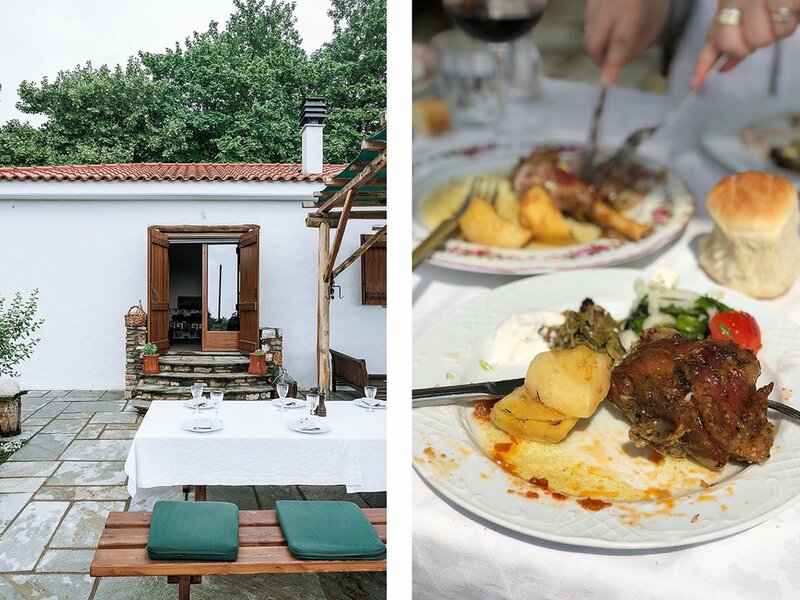 The best tsipourádiko for a long, boozy lunch — which is normally followed by an afternoon siesta, or, as many Greeks like to joke, a visit to the mistress — or a raucous dinner is Me Zen, a hip taverna run by the effortlessly cool (and epically mustachioed) Andreas Diakodimitris and his towering chef, Grigoris Helmis. They source locally (and from their own farm) to supply everyone from college students to retired fishermen with rounds upon rounds of top-notch tsipouro and a succession of Greek food’s greatest hits: anchovies bathed in paprika-infused olive oil, smoked red peppers, tirokafteri (spicy feta dip), taramasalata (cured cod roe dip), potato salad topped with fried anchovy bones, cod sauteed with raisins and onions, kokoretzi (a sausage of lamb offal served at Easter made here with flying squid instead), mussels with local sausage, the requisite souvlaki, more cod baked with onions and tomatoes, and — as any debaucherous dinner turned preemptive breakfast should include — scrambled eggs with succulent beef and a pipping hot pot of baked eggs in tomato sauce. One of the many streams that runs through the mountain. In the morning, the drive north from Volos up to Mount Pelion is nothing short of magnificent. 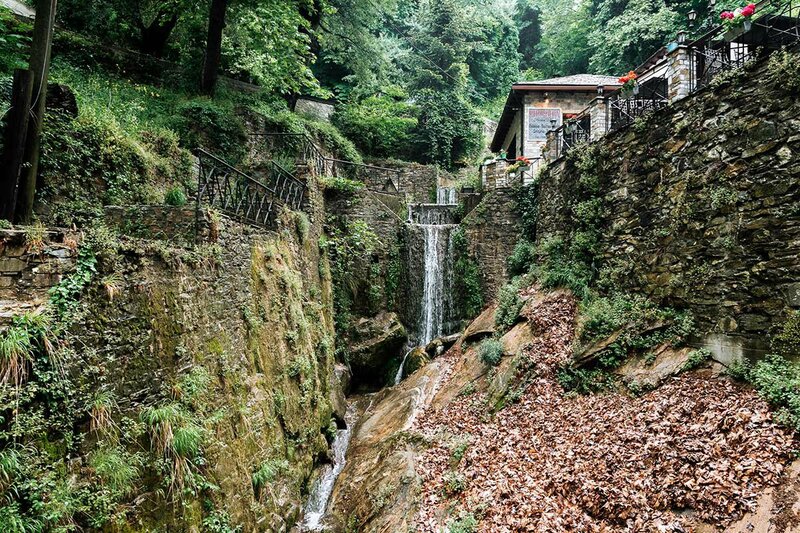 Clouds roll down through thick forests dashed with streams and springs and dotted with vacation homes belonging to a pantheon of well-off locals. (Before them, the gods of Olympus took their summer holidays here.) According to Greek mythology, this is the land of the centaurs, the most famous of which, Chiron, trained heroes like Hercules, Jason, and Achilles, whose parents were married on the mountain. Between 30 and 40 villages and settlements stud the mountainside, each more charming than the next, all of them worthy of staring in a fairytale. Pelion Railway, a restored locomotive that chugs through the trees and across old bridges between Lechonia and Milies, is one way to experience the mountain, though most locals just make a beeline to their favorite town. Some are known for their culinary offerings, others for being near a rejuvenating spring, invigorating hike, ski slope, or secluded beach. Almost all towns benefit from sweeping views, either of the Pagasetic Bay or, on the other side of the mountain, the wide-open Aegean. Making spanakopita at Karaiskos Farm. Though it takes plenty of repeat visits to pay proper respect to the mountain, one can get a good taste with only a day trip on the books. Makrinitsa, the closest town to Volos, is lined with low-key shops, inns, and cafes — like Theophilos, famous for the mural hanging on its wall by the Greek folk painter Theophilos Hatzimihail. Women's Agritourism Cooperative in Zagora is one of the oldest women-run food co-ops in the country and is the place to pick up housemade Greek pasta, or trahana, and spoon sweets, which preserve seasonal fruits and nuts in lusciously sweet syrup. 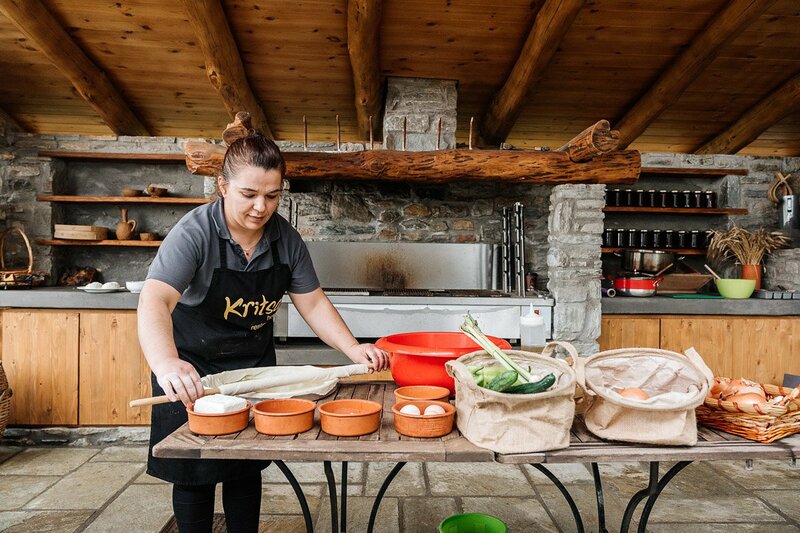 The real gem in the area, though, might just be Karaiskos Farm, where chef Eleni Kariaskou leads cooking lessons using ingredients from her ten-year-old organic family farm and garden, which also supplies Kritsa Hotel & Restaurant, her lauded culinary establishment in nearby Portaria. Each lesson starts with a foraging tour of the farm, which has rows of herbs, hundreds of fruiting trees, and herds of pigs, goats, and chickens, and concludes with a feast of Greek classics guests learn to make — flakey spinach pies, stuffed peppers and grape leaves, spetzofai (local sausage and peppers), slow-cooked lamb, alga me chorta (sauteed mountain greens with fried eggs), freshly made bread, loukoumades (Greek donuts), tons of ouzo and tsipouro, and a bounty of local cheese, wine, and olive oil. 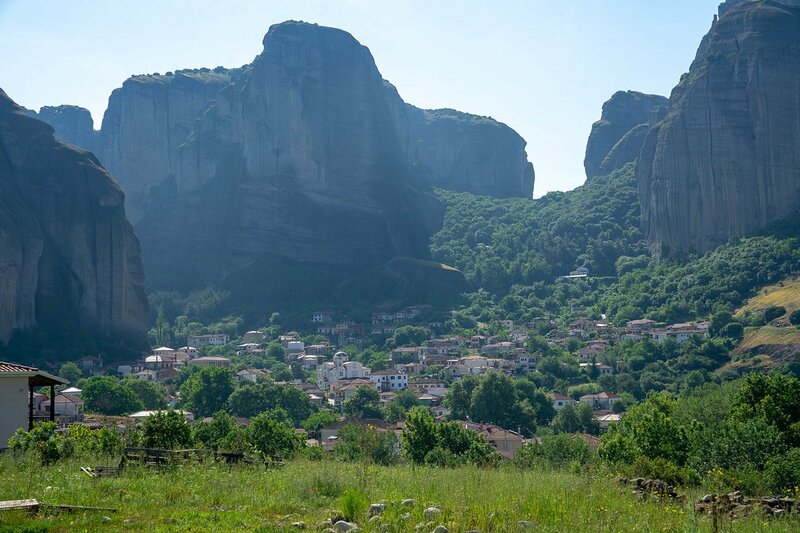 Meteora: The view from below. Ways of getting to the top. Note the rope leading up to the tower on the right. 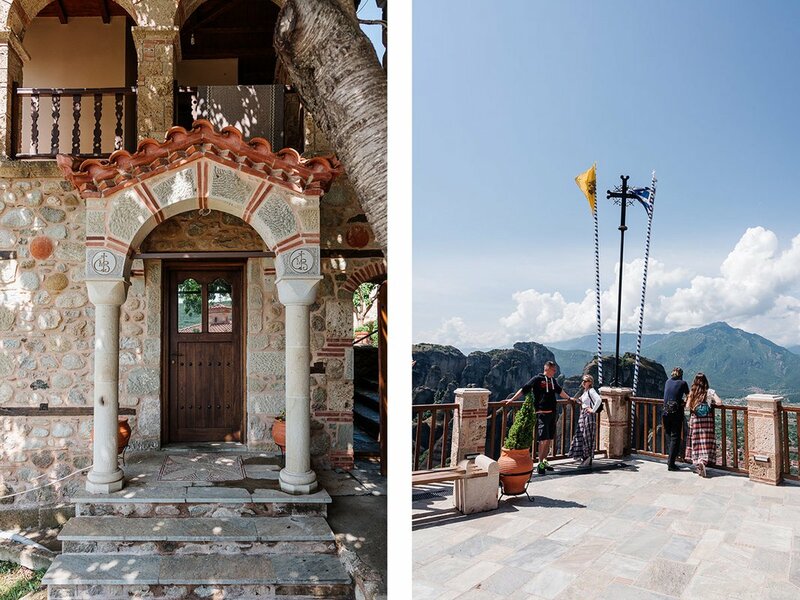 If this says anything, it’s that the climb is worth it, and not just to spritz with holy water in one of the spectacularly ornate Eastern Orthodox churches. 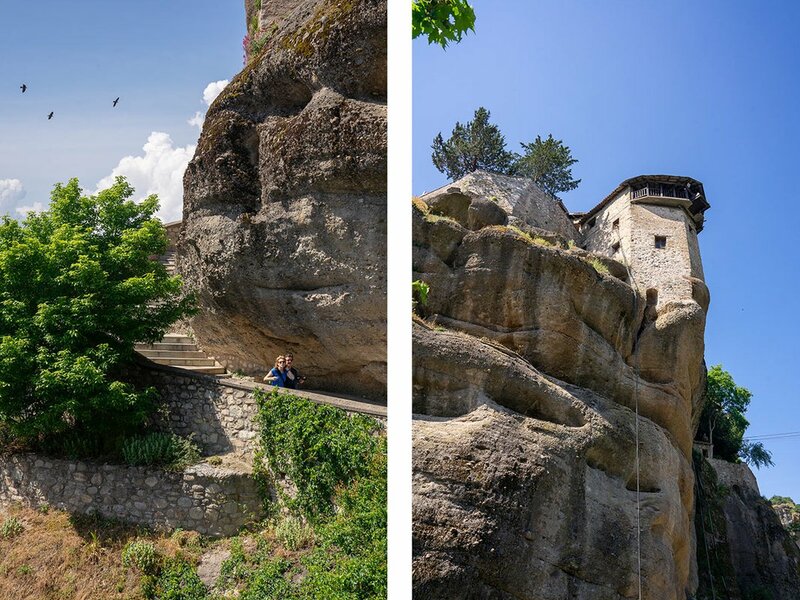 Taking in the view from any of the six precipitous monasteries borders on a spiritual experience — winding roads and towering peaks extending out into the distance invite quiet meditation. (These monks sure knew how to pick a location.) 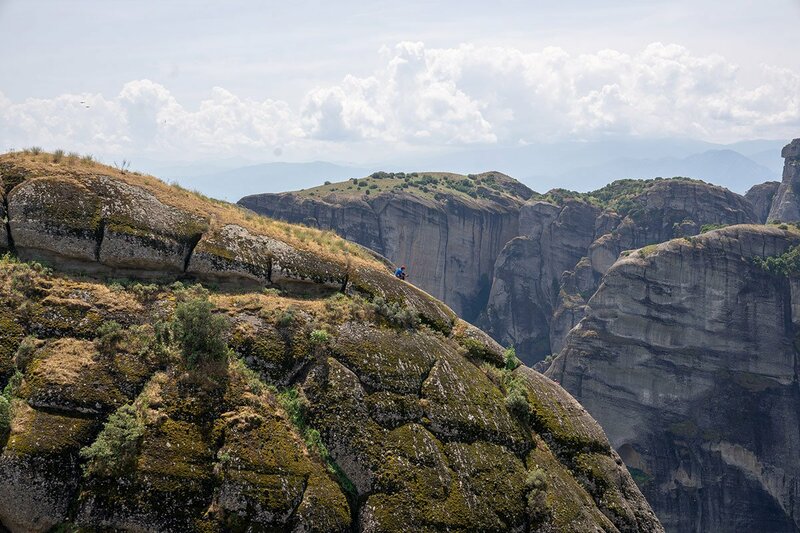 Natural caves that freckle the giant boulders, the original havens of hermits seeking spiritual isolation for thousands of years, are another draw, especially for adventurous rock climbers that opt to reach them via rope and rappel. A rock climber after ascending one of the boulders. Holy Monastery of Great Meteoron. Fly into either Athens International Airport (ATH) or Thessaloniki Airport (SKG) and rent a car. 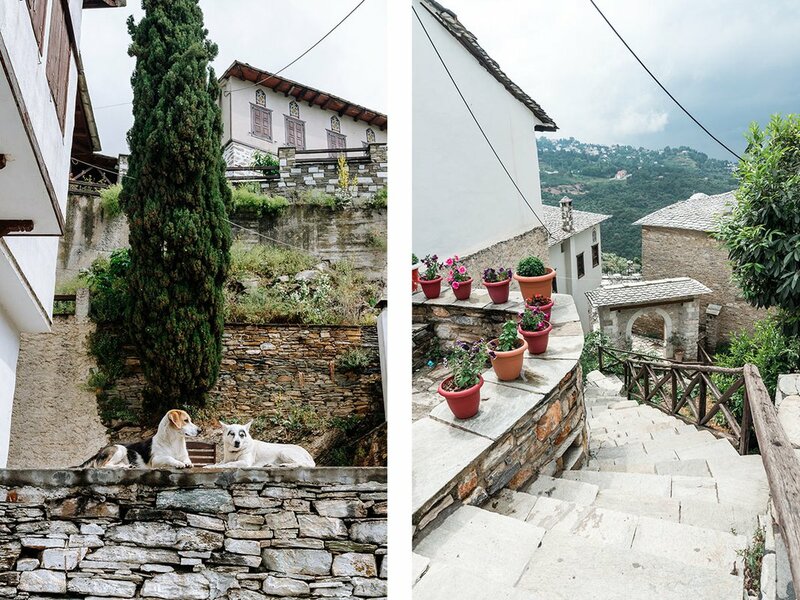 The drive to Volos is 2.5 hours from Thessaloniki and 3.5 hours from Athens. From there, it’s an hour or two to the other destinations. 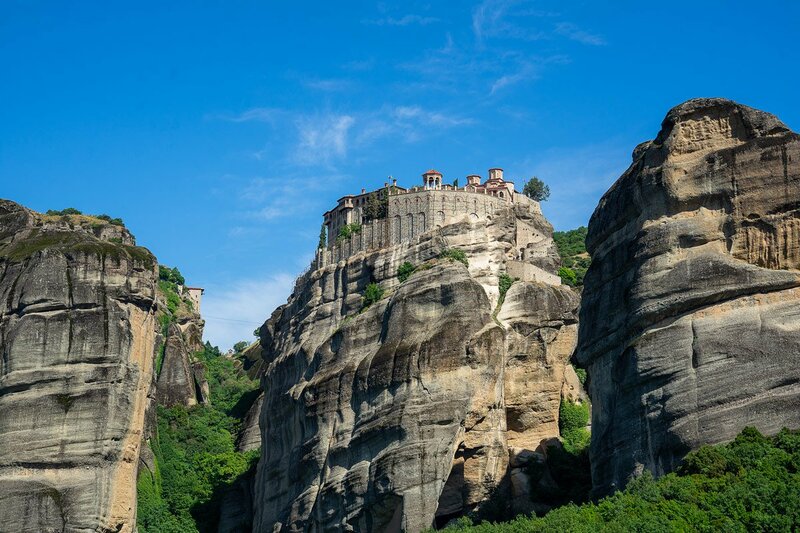 Budget at least five days for the trip or skip out on Meteora for an amended version. 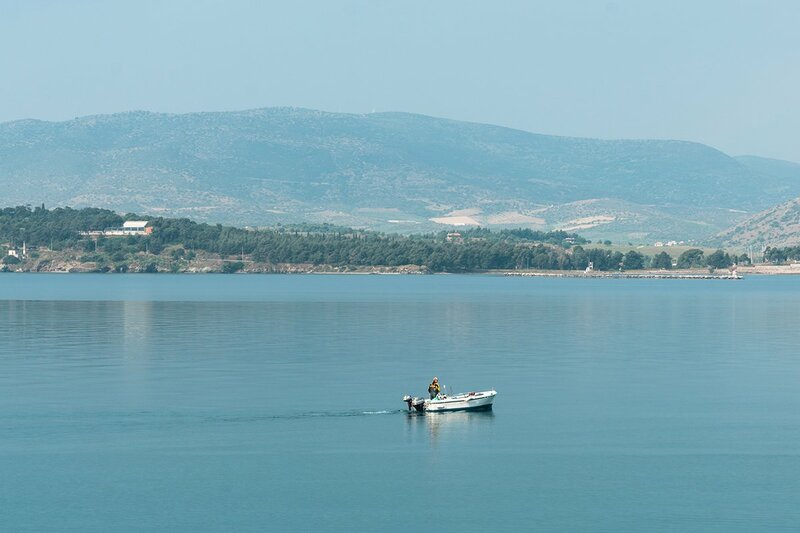 The mainland is best in the spring and fall, when temperatures are more moderate, tourists are farther and few between, and farms, olive groves, and vineyards are brought to life.